Listed for $1729000 and closed for $1,600,000. 62 x 187 lot in walk to train location. 4 Bedroom plus one in the lower level, 5 full and 2 half baths. 3 fireplaces. 6000 square feet. On the market for 38 days. Listed for $719,000 and closed for $670,000. 9 days on the market. 4 bedroom, 4 bath on a 50 x 132 lot. Finished basement with 5th bedroom. On the market for 113 days. Listed for $425,000 and sold for $410,000. Aspen model in move-in condition. 3 bedroom, 2 1/2 bath, hardwood floors, finished basement. 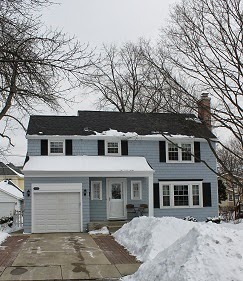 Listed in 2011 for $349,000-on the market for 178 days. Back on in 2014 for $347,000 and closed for $347,500. 3 bedroom, 1 bath on a 47 x 138 lot. First listed in October 2006 for $419,000-on for 92 days. Back on for $399,900 for 233 days. Back on in July of 2013 for 250,000 and lowered to 215,000. Closed for $212,500 after 298 days. This bi-level was rehabbed and put on the market in Sept. of 2006 until July 2007 for $489,000-on for 298 days. Back on in 2009 for $424,900 and lowered to $415,000-on for 40 days. Back on in November of 2013 for $449,900 and lowered to $435,000-SOLD for $425,000 after 130 days. This home had sold in 2005 for $402,000. 3 bedroom, 3 bath on a 49 x 133 lot rehabbed. Was rented out between listing periods. On the market for 124 days. 4 bedroom, 1 1/2 baths on a 60 x 131 lot. Originally listed for $509,000 and lowered to $425,000. Closed for $395,000. I hear it is going to be torn down. Sold in 2 days-Listed for $519,000 and sold for $522,000 with a $4,000 closing cost credit. 4 bedrooms, 2 1/2 baths, finished basement, new kitchen in a walk to train location. Lot 50 x 131. Listed in August 2012 for $829,000 and on the market for 534 days with a final list price of $609,000. Closed for $592,500. Home had a couple of offers along the way. 5 bedrooms, 4 full and 2 half baths, 3 car garage, 3 fireplaces. Built in 1919, lot 50 x 132, 3 br, 1 1/2 bath, 2 car garage on the market for 5 days. Listed for $249,900 and sold for $287,000. This was a short sale and had sold in July 2006 for $380,000. 3 br, 2 bath built in 1960. Lot 50 x 187. This home was listed for $439,900 and sold for $410,000. Well maintained one owner home. Listed in August of 2013 for $279,900 and on the market for 194 days. Cancelled at price of $265,000. Back on in February of 2014 for $269,000 and sold for $265,000. 3 bedroom with a basement. 4 bedroom, 3 bath home on a 115 x 150 lot with the ability to buy an additional 33 feet from the Village. Listed for $724,900 and closed for $670,000. Vacant lot 52 x 200 x 63 x 175 Zoned for a single family home or a 2 family home. Listed in 2010 for $305,000 and reduced to $285,000-on for 767 days. Back on in 2012 for $249,000-had a contract that fell through-on for 279 days. Back on in 2013 for $225,000 and sold in 130 days for $170,000. Walk to train and town. Sold before processing! Listed for $524,900 and sold for $490,000. 66 x 147 x 71 x 147 lot, 3 bedroom, 2 1/2 bath.